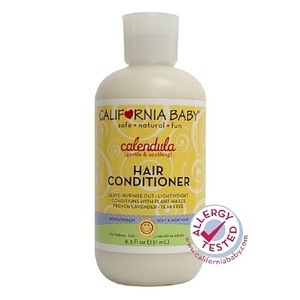 California Baby's Calendula Hair Conditioner is infused with the essence of the wonderful flower Calendula (kal' len' dula). Commonly known as the Pot Marigold, this flower has been used to soothe skin for centuries. Recommended for those with sensitive, irritated or extremely dry scalp. California Baby's no tears formula is a natural botanical blend of herbs, rich emollients, and natural sunscreens that combine to leave delicate hair shiny and smooth. Our signature aromatherapy Calming blend of essential oils combines perfectly with the herbal bouquet of Calendula. Works to protect from damage caused by chlorine, salt water, and the sun's harmful rays. 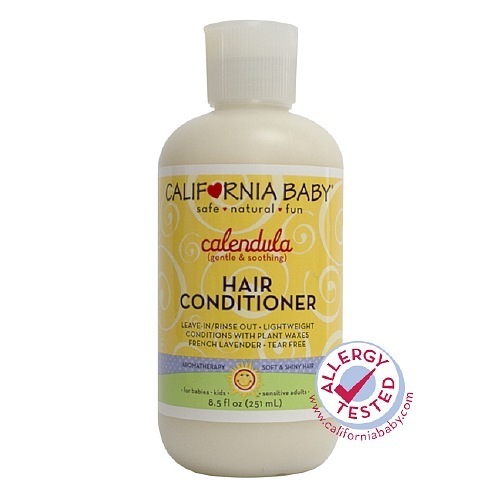 100% botanically based, California Baby Hair Conditioners work to maintain natural shine and flexibility and are lightweight so you can leave in for extra conditioning. Partner any California Baby Shampoo & Bodywash blends with one of our ultra-moisturizing, all-natural Hair Conditioners for shiny, smooth and manageable hair. Our proprietary complex is a blend of rich organic and all natural plant waxes and emollients, herbal and floral extracts to leave even the most damaged hair moisturized and cared for. For extra-curly or tangled hair, use in combination with our Hair De-Tangler. Made in our very own FDA approved and Organic-registered facility. Our products smell good and children might want to take a taste although safe and natural, if ingested, your pediatrician should be your first point of contact. External use only. 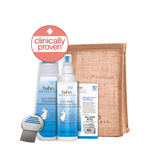 • After shampooing, massage a generous amount evenly through hair. • Leave on 2-4 minutes. 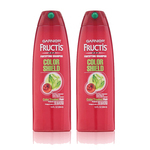 • For extra conditioning or to soothe dry irritated scalp, do not rinse out. Tip: For extra-curly or tangled hair, do not rinse out; use in combo with our Hair De-Tangler! Water, Brassicyl Isoleucinate Esylate, Brassica Alcohol (Waxes from the Cabbage Plant Family), Cetyl Alcohol (Sustainable Palm Fruit Kernel and/or Coconut), Carthamus Tinctorius (Safflower) Oleosomes, Vegetable Glycerin USP (Sustainable Palm Fruit Kernel and/or Coconut), Calendula Officinalis Extract (Calendula), Viola Tricolor Extract (Pansy), Yucca Schidigera (Yucca) Extract, Panthenol (Vitamin B5), Aloe Barbadensis Leaf Juice (Aloe Vera), Simmondsia Chinensis (Jojoba) Oil, Pure Essential Oils of Lavandula Angustifolia (French Lavender), Salvia Sclarea (Clary Sage), Gluconolactone (Sourced from Corn (Non-GMO)), Sodium Benzoate.